448 pages | 208 B/W Illus. 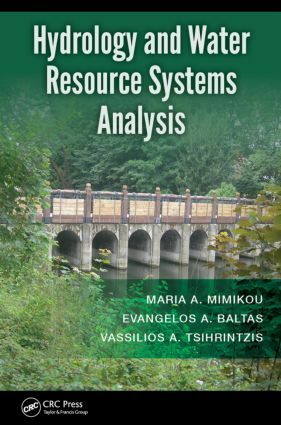 Hydrology and water resources analysis can be looked at together, but this is the only book which presents the relevant material and which bridges the gap between scientific processes and applications in one text. New methods and programs for solving hydrological problems are outlined in a concise and readily accessible form. Hydrology and Water Resource Systems Analysis includes a number of illustrations and tables, with fully solved example problems integrated within the text. It describes a systematic treatment of various surface water estimation techniques; and provides detailed treatment of theory and applications of groundwater flow for both steady-state and unsteady-state conditions; time series analysis and hydrological simulation; floodplain management; reservoir and stream flow routing; sedimentation and erosion hydraulics; urban hydrology; the hydrological design of basic hydraulic structures; storage spillways and energy dissipation for flood control, optimization techniques for water management projects; and methods for uncertainty analysis. It is written for advanced undergraduate and graduate students and for practitioners. Hydrologists and water-related professionals will be helped with an unfamiliar term or a new subject area, or be given a formula, the procedure for solving a problem, or guidance on the computer packages which are available, or shown how to obtain values from a table of data. For them it is a compendium of hydrological practice rather than science, but sufficient scientific background is provided to enable them to understand the hydrological processes in a given problem, and to appreciate the limitations of the methods presented for solving it. "This book provides a balanced approach to surface, subsurface and contaminant hydrology… [and] a good tool that will help prepare students of hydrology in analyzing, studying and solving issues in the real world. The text is user friendly, and consists of basic figures with numerous reference examples which students will appreciate. It is also a good reference companion for professional engineers and environmental scientists." "… covers important aspects of groundwater hydrology and hydrologic modeling. A good book for an undergraduate curriculum." Dr. Maria A. Mimikou is a professor of Hydrology and Water Recourses in the School of Civil Engineering at the National Technical University of Athens and director of the Laboratory of Hydrology and Water Resources Management, Greece. She established the Center of Hydrology and Informatics (www.chi.civil.ntua.gr/) and the Hydrological Observatory of Athens (http://hoa.ntua.gr/). She has vast experience in water resources systems, modelling and management; urban, rural, coastal and stochastic hydrology; soil erosion and sediment transport; forecasting and risk assessment of extremes; hydrological studies and field works. She has authored several books and peer-reviewed papers. She is coordinator of many EU competitive and national research projects. Dr. Evangelos A. Baltas is a professor in the School of Civil Engineering at the National Technical University of Athens (NTUA), Greece. He actively participated in the establishment of the Center of Hydrology and Informatics (CHI) in Athens, which comprises the NTUA meteorological network, the database of the hydrological information and the experimental basin. He has also offered engineering consultation services in the fields of his expertise to the EU, Greek ministries, public organizations and private companies in the United States and Europe. He has been the principal investigator or researcher in competitive EU and national funded programs related to integrated water resources management. Democritus University of Thrace, Greece, for several years, and was also an associate professor of water resources engineering at Florida International University, Miami. Dr. Tsihrintzis has experience as a practicing civil and environmental engineer both in the United States and Greece.